I was first introduced to Tynker by another teacher last year. I decided to use the platform because I felt that it was a great step forward in terms of what I wanted to do with the computer science program at WNS this year. What started out as a small pilot became a full-fledged Tynker program. I began by trying out the software with a 5th grade class, telling them that they were my “beta testers.” This generated great interest in the program. With this initial class, I was able to get more familiar with the platform. Afterwards, I rolled out programming units for the 3rd grade and 6th grade. We used a step-by-step approach to learn about programming logic. Here’s an awesome project made by a student from one of my 5th grade classes. Its a multi-level game that keeps getting harder each level. Click on the green arrow to play the project. For controls, use the arrow keys to move and “z” to shoot. Enjoy! In just a few months, teachers began to see Tynker as an invaluable part of our STEM curriculum. I’ve gotten a ton of positive feedback from parents. Students from the 2nd to the 7th grade have enjoyed using it in class. Tynker gives the teacher better flexibility in terms of assessment and guided instruction, providing specific lessons to help students attain mastery on particular concepts. Combined with the natural flexibility of a “sandbox” mode where students can create anything, this structured approach to concept mastery helps students develop their skills and become better able to make their ideas comes to life. Moreover, with Tynker, it’s easy to expand your computer science program. There are so many different ways to implement the platform, in school and out. In addition to lessons that are taught during the school day, for example, we also have a lunchtime coding club that meets a few times a week. Additionally, I run an after-school programming club for students who are interested in video game design. 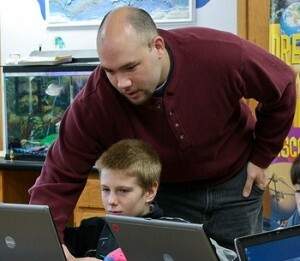 Our computer science program is centered around attaining computer literacy, developing STEM skills, and exploring citizenship and responsibility in an increasingly digital culture. Teaching programming through Tynker helps our students develop their logical abilities and improve their problem-solving skills, while giving them an environment where independence, tenacity, and creative thinking are encouraged. 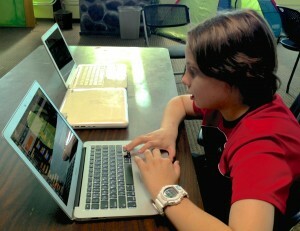 Figuring out how to use the Tynker environment gives students the confidence to use other computer software. 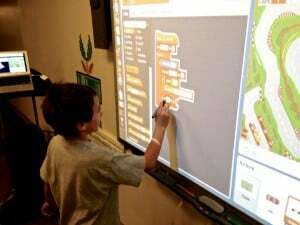 The incidental knowledge they gain from producing their own stories, games, and activities connects with our digital citizenship curriculum as well as other core standards. Perhaps most importantly, students using Tynker are producers of their own content, a skill that benefits them throughout their school years and beyond. Westside Neighborhood School, like other private schools, dedicates itself to improving the learning process. Here, students are encouraged to take more responsibility for their education. The WNS curriculum is designed to engage students in a project-based, active learning curriculum that challenges all students to grow, while recognizing that children have different learning styles and learn at different rates. Tynker’s mission aligns perfectly with that philosophy. Our platform is customizable, which means that students are able to create and learn in a way that makes sense to them, in a way that excites them. The earlier students have access to opportunities like this, the better. Regardless of what field they choose, using Tynker will guide them towards a path of lifelong learning. Are you a teacher who wants to start a CS Education program in elementary school? To run it as successfully as Don does, begin small and build up. If you haven’t already, request an invite to Tynker and start a pilot program. (This is most easily done in one grade level.) Get to know how Tynker works. As you become more familiar with the platform, you can start integrating Tynker into other classes and grade levels. You may also want to use it in other ways, perhaps in a lunchtime club or after-school program. Need more help? Email us at support@tynker.com.